So yesterday we had a very impromptu visit to the beach. It was a beautiful day, sunny and 20 degrees and that doesn’t happen too often in our wee country! We got a phone call about 11.30am from friends saying they were heading to the beach so we decided to make the most of the weather and go too. The beach is an hour’s drive from our home so I didn’t have time to think about it. We got ready, packed up swimming costumes, spare clothes, shoes, a picnic and hit the road. It was only when we arrived that the realization of where we were hit me. The beach was busy with kids running around, building sandcastles, burying each other, splashing in the sea and having a great time. Max and the other kids in our group all kicked off their shoes and socks, got into swimming gear and started playing. And as soon as Lucia saw all of this she started pulling at her little crocs and tights asking me to take them off so she could play. And my heart felt like it broke a little bit in that moment. I tried to explain that she had to keep her tights on to look after her legs and feet and her crocs were especially for the beach. But she wasn’t having it. She cried big fat tears as she asked me again to take off her shoes and tights and started trying to take off the crocs. It took all my strength not to cry with her and just try and explain things again but she was so upset. I also felt so sad looking at her playing on the beach on a sunny day with these tights on, not able to enjoy the feeling of the warm sun on her legs, or feel the sand between her toes. I looked at all the other children in their swimsuits and bare legs and feet without a care in the world, running in and out of the sea covered in sand and I felt so sad that Lucia couldn’t enjoy such a simple pleasure. She has the cutest swimming costume that she wears to the pool but I couldn’t bring myself to put it on over her tights. After a little while the sandcastles lost their appeal and Lucia then wanted to go into the sea. The tears came again as I tried to explain that she couldn’t – then Daryn suggested taking off her tights and putting her in her crocs for a little paddle. In the end he carried her down and just let her feel the water on her feet. She laughed at how cold it was but I think she enjoyed the experience. Then we had to take her off the beach to a seat by the grass, get her well dried off and get the tights back on before any sand got stuck to her. And more tears. We briefly considered letting her keep them off for a little while and just let her wear the crocs, but my fear of her cutting her feet or legs on a pebble or getting sand stuck in her toes and causing infection was too great. So on they went with a bit of a struggle. And then she said ‘I want to go home’. At the tender age of just two years old she already wanted to do what her brother and friends were doing. And she knew she couldn’t. And it upset her. Which upset us. If this is how she is already feeling what is it going to be like as she gets older? How will she cope? How will I cope? I’m feeling a little emotional just writing this and thinking about yesterday and the future. I am usually very upbeat and positive but yesterday was a new experience for us all – and one that I found quite tough. I don’t want Lucia to feel different. I don’t want her to look different. I don’t want her getting upset because she feels left out. I want her to be happy, to be able to do anything she wants. But sometimes – like yesterday – she can’t do things exactly the same. And I hope that we can manage to help her through these times as she gets older, help her remember that although there will be times when she will have to do things a little bit differently she is still completely perfect in her own way, that she can feel secure and confident in herself and always remember that she is loved so much. Before we left the beach we once again took off the tights and ensured any rogue grains of sand were brushed out. We washed her feet and legs with bottled water, dried them off and settled her with a biscuit to coax her into letting us put them back on. And then we came home. And I felt like I could breathe again. What I have to remember though is: nothing bad happened. She got through it ok. Until today, trips to the beach had been in the winter where we were all wrapped up in winter coats and shoes with no worries – but the beach on a sunny day is a different story and brings a lot of fear, worry and a little bit of sadness too. This was really our first glimpse into potential difficulties summer may bring and a million thoughts are whizzing through my head now about our holiday to France. I know we will probably only spend a day or two on the beach when we are there but any advice on making the next trip slightly less stressful is very welcome! Is there anything else I should have done or could do in the future? Was I being too cautious? How do others with Lymphoedema manage on the beach? 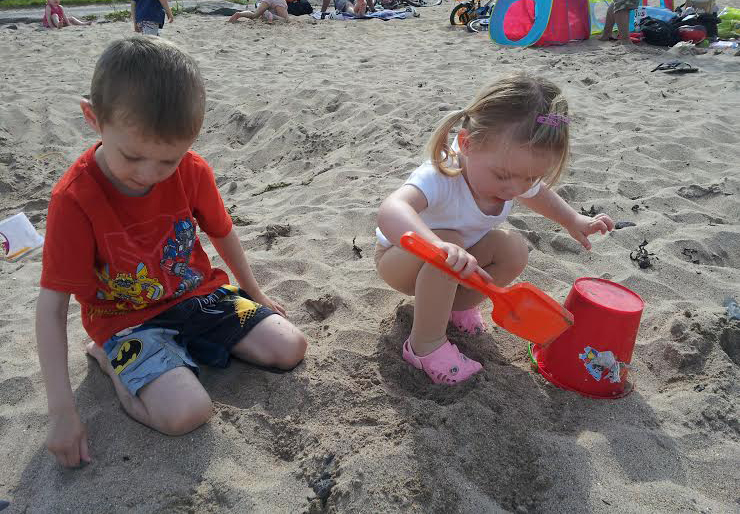 Have any other parents got beach experience they would like to share? Would it be ok to take her tights off for a little while as long as she has shoes on? Though because her legs are affected too I can’t see that being a good idea due to the risk? All in all the beach was new territory and we just need to learn how to deal with new situations like this and manage them with confidence so Lucia can also learn to manage them in the same way. And we will. Oh gosh my heart goes out to you … I wonder what other parents do… I would think to have the tights off for a while would be ok… Especially to paddle in the water… Main thing is to have a good rise off after… As adults some wear stockings and some not at the beach i think it depends on how quickly legs swell… Hugs to you..
Me again, reading your blogs takes me back to where I was with Isla 2 years ago. And reading this my heart started racing remembering the anxiety and upset I faced with the same situation. Isla as you know is on knee high stockings, her feet are too swollen for crocs so it was Velcro sandles for her. Whatever you decide to do you’re doing it for the right reasons so try and relax enough to enjoy Lucia enjoying herself. I am touched by your post and pray that the Lord gives you answers as some of us wish to give advise but can’t. I have been diagnosed with Lymphadema 5 months ago. I have been crying day in and day out because I still don’t know how to cope with this condition. Being diagnosed at the age of 21 (no children,no husband and have just started working.I sometimes wonder if there is someone out there who would be interested in someone like me. My parents and siblings don’t really understand what I am going through and the condition is all about. They think it will go away and sometimes bring me pills and creams they hear about from friends.Not being given any information on how to take care of myself made matters worse for me, my Dr only said wear your compression socks immediately when you wake up and take them off when you are in bed at night, for the rest of your life. I came across your blog while trying to look for answers on internet as Doctors here don’t have time to explain to patients how to handle this kind of situation or at least refer me where I could get help. What I am trying to say is that I feel your pain and pray for diven intervention because people like me and Lucia deserves a chance to enjoy a normal life. I have already learnt a lot from your blog. Thanks very much for sharing. Deb Bow Can you keep a pair of compression tights just for water and beach? Then change into water shoes for the water part. Then rinse and rinse and dry and dry before changing. That is actually what I personally do. Blessings to your beautiful little girl and your family!